I'm posting another birthday card for another friend! As I type this, I really am counting my blessings, I have so many wonderful friends! 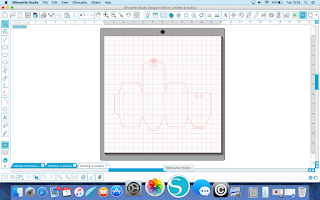 I've used the welding tool in the Silhouette Studio software and the pen holder again ;)! 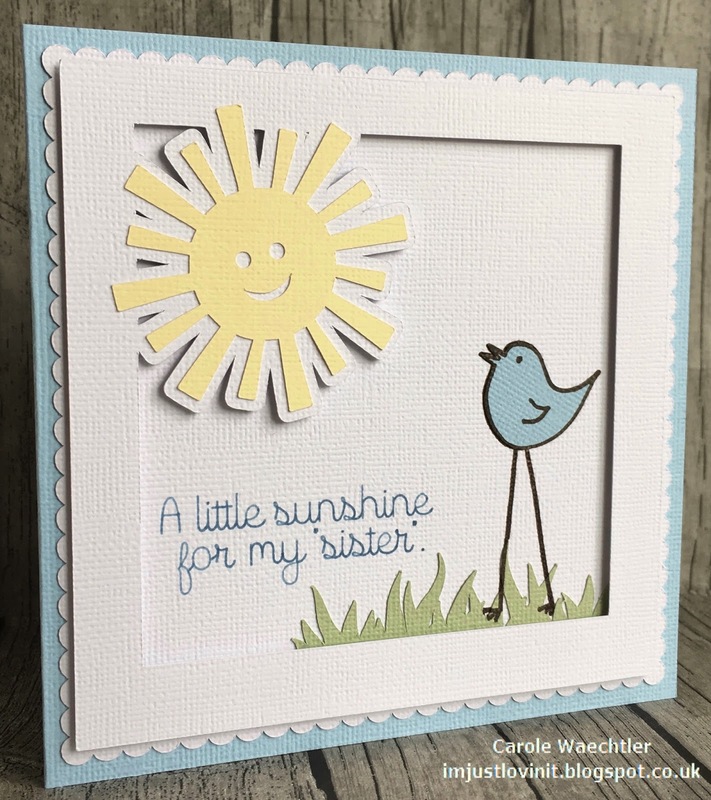 I hope you like this simple welded card, welding has to be one of my favourite tools in the Silhouette Studio software! 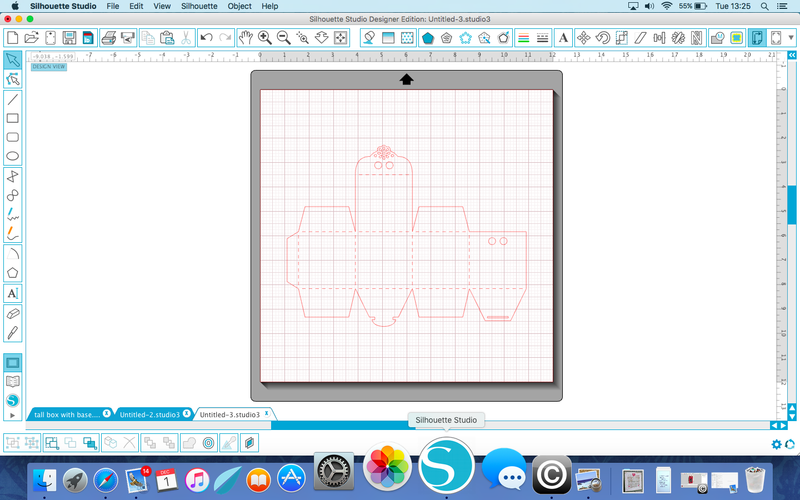 Hope you have some time to craft with your Silhouette machine today. 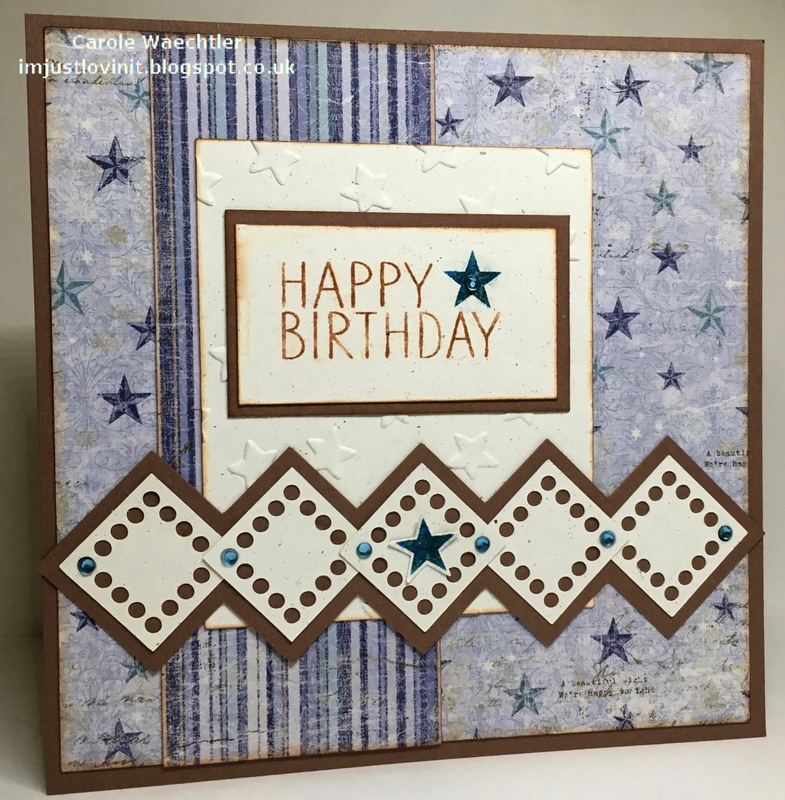 I'm back today with another card for a different friend, who actually celebrated her birthday last month. With so many things happening around here, beyond my control, I didn't actually manage to make it in time - whoops, but as it was a special birthday, I couldn't let it slip. I thought "better late, than never"! 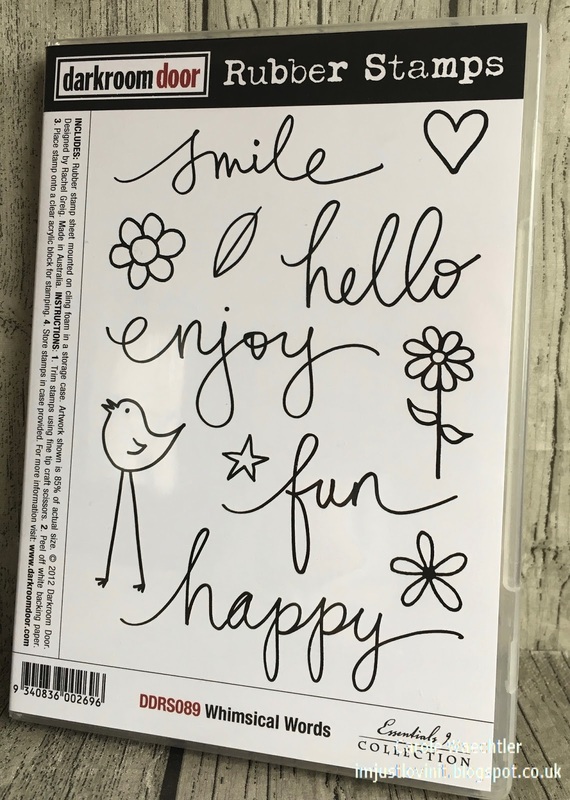 I made this card using the "welding" tool in the Silhouette Studio software, along with a pen tool holder for the writing and dashes around the aperture. 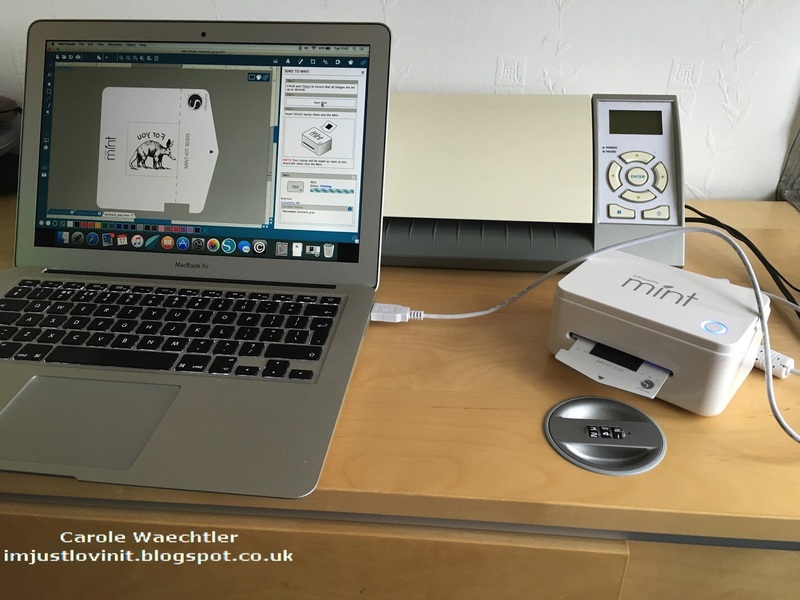 Happy crafting with your Silhouette machine. One of my crafty friends is celebrating her birthday today, she's a really great card maker, which makes me nervous when I'm making her a card! 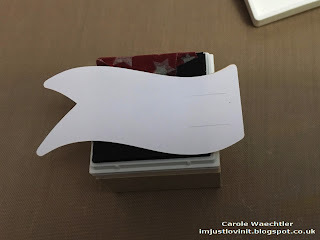 I knew I wanted to use the bird from a Darkroom Door stamp set I have and of course, my Silhouette Cameo! 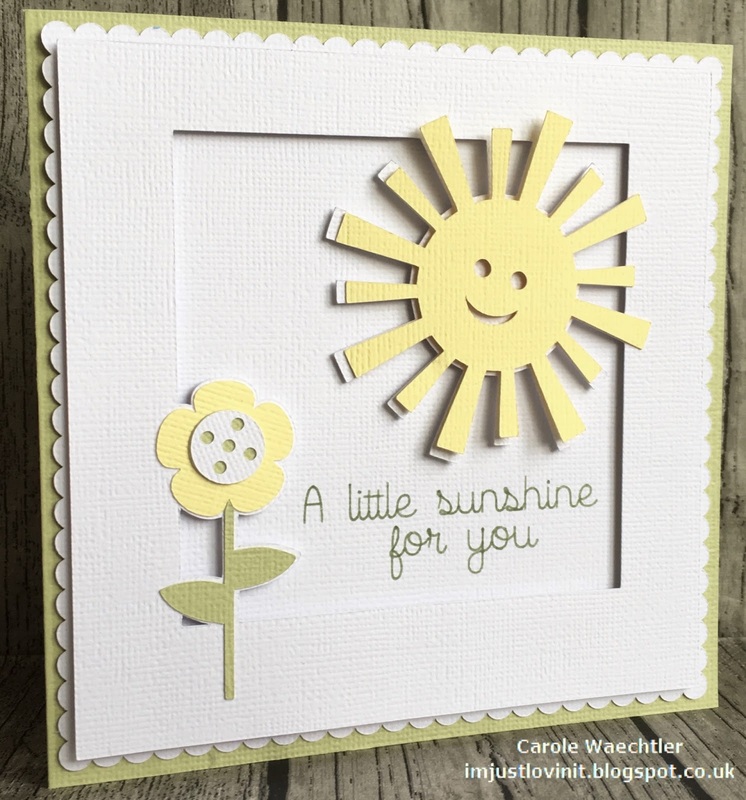 ......and here is the card I finally made! 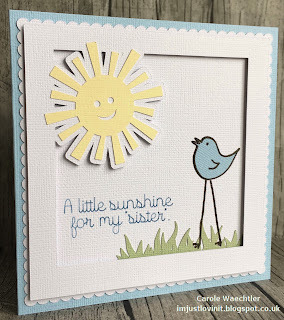 I hope you like the card, you may well want to know why it has "sister" on the front, well my friend is an only child and wishes she had a sister, one just like me, how nice is that? 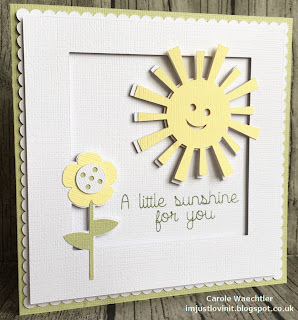 I had a great time making this card, in fact I have a few more to share, all very similar, so watch this space! 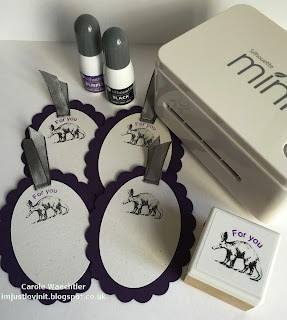 Silhouette Mint - the best stamp ever! This really does have to be the best stamp ever! It'll certainly help with my Christmas cards this year and next! It's our own handwriting, no one would ever know (except if they see this of course)! I'm just loving' it all - my iPad, my Mac & my Silhouette Mint! If you only had one eh? 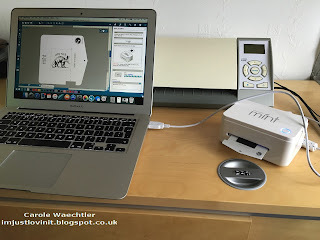 Happy crafting with your Silhouette machines. 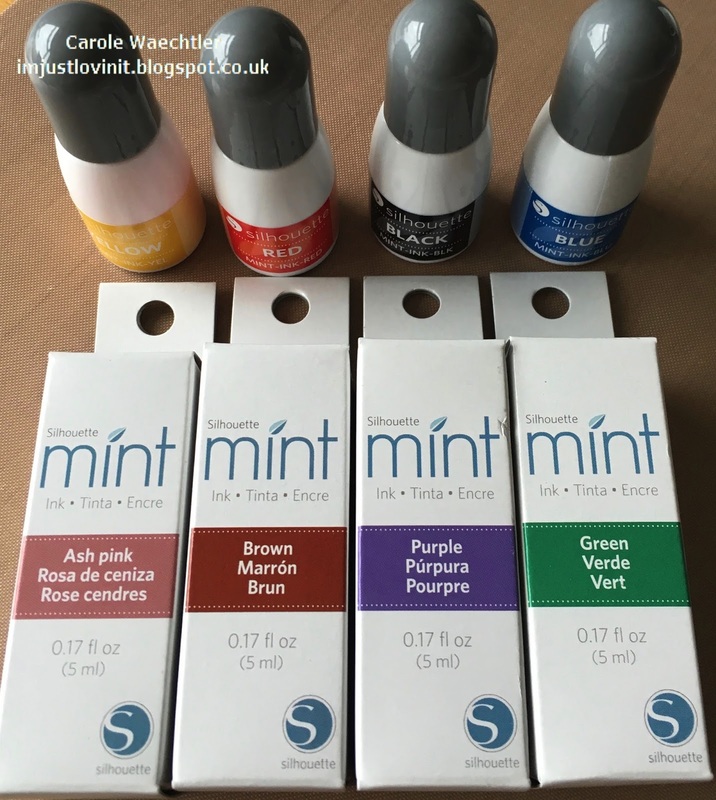 Silhouette Mint - Quick & Easy Party ideas! I'm sharing some very easy, quick & colourful party ideas for you today. All you need is a Silhouette Mint and possibly a Silhouette Cameo ;)! I used the Silhouette Studio software and Silhouette Cameo to cut out these little party flags. 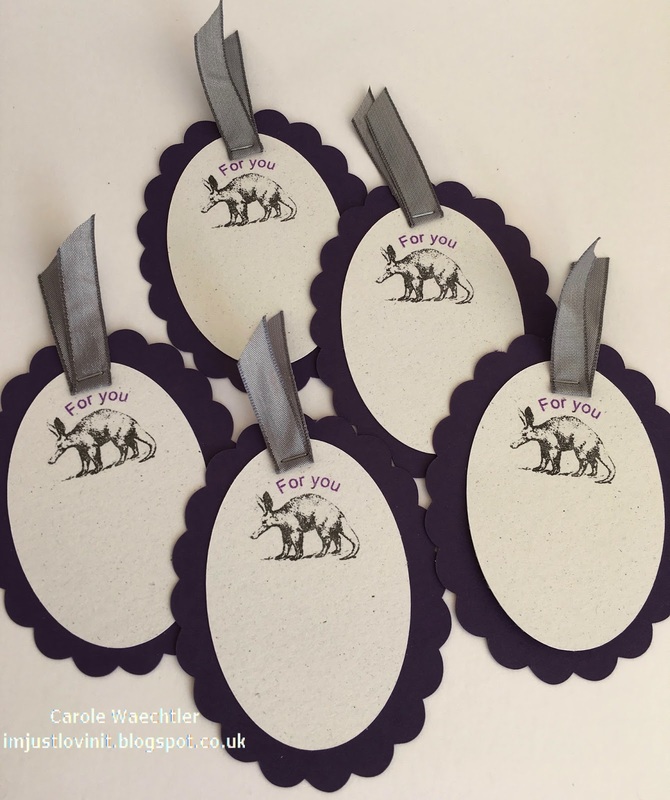 I'm sure these would be easy to cut without the Silhouette Cameo, if you don't have one! 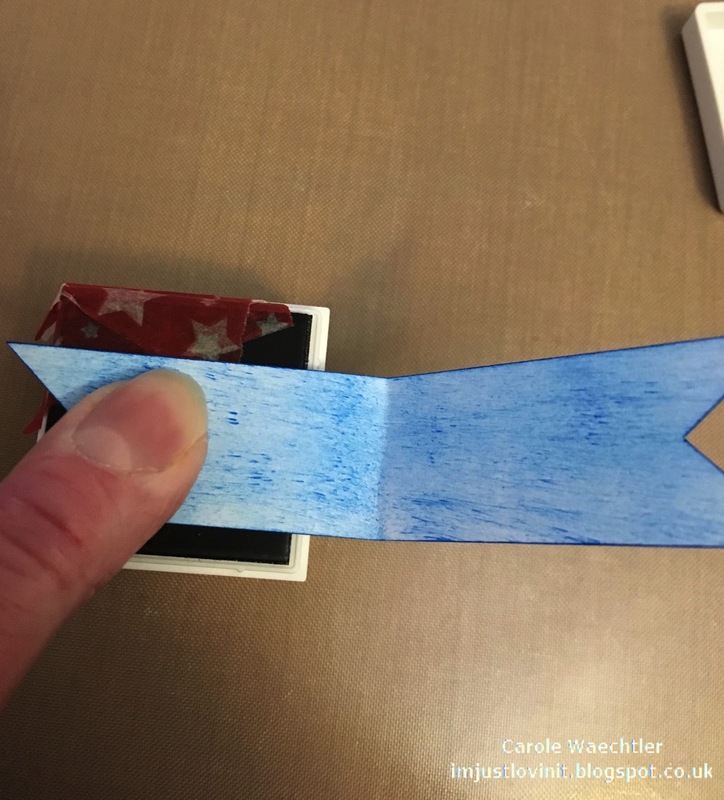 I decided the best way to stamp the Aardvark was to turn the stamp upside down and place my little flags on the stamp, you can see me pressing my finger onto the back of this blue flag, transferring the image. 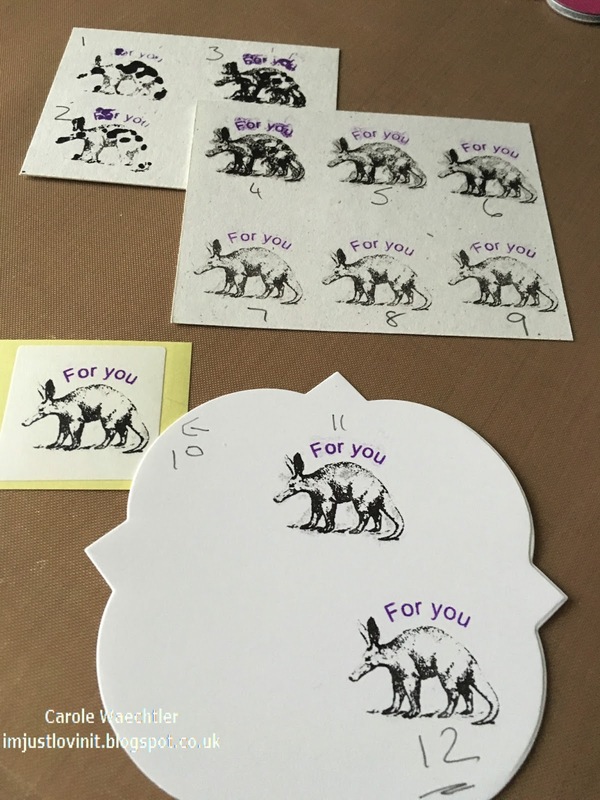 All the Aardvarks were stamped without having to refresh the ink on the stamp. So quick, no mess :)! 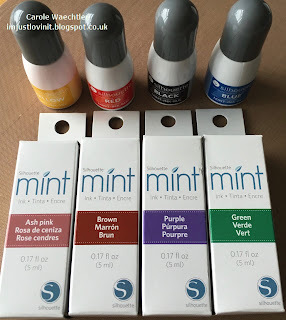 Why do I need a Silhouette Mint? Why do I "need" a Silhouette Mint? I expect most paper crafters would like to know exactly why they do need a Silhouette Mint, especially if they are crafters who like to use rubber stamping techniques on their projects. I've had my Silhouette Mint for almost a week and already I'm really pleased to have it, I have a whole head full of ideas now, of why I need it and what stamps I plan to make. 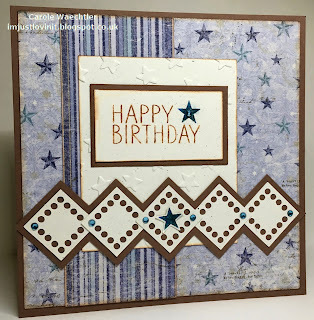 The first stamp I made, I made with little thought, I was excited to try it out and get a stamp made as quickly as I could, so I chose to make one with "Happy birthday" on it! That was quite probably a mistake because I have so many stamps in my stash and I dare not even begin to count how many I have with that sentiment on! 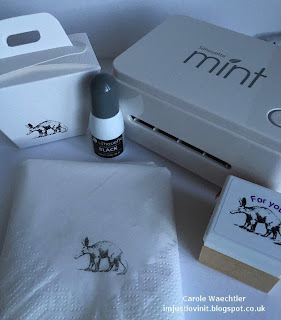 For a crafter wanting to venture into rubber stamping this little Mint, would be perfect. 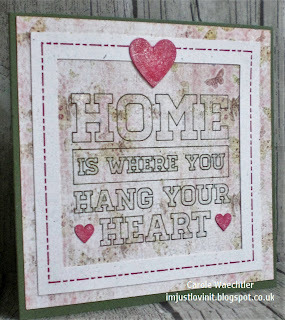 They could be making all the sentiments they need, at what size and shape they want them. 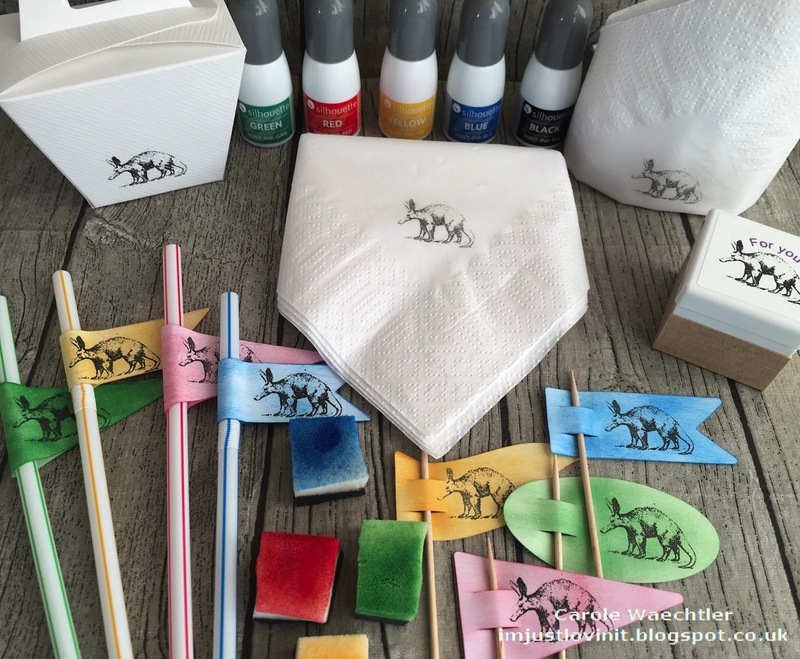 All they need is a small stock of the blank supplies at home ready and waiting. 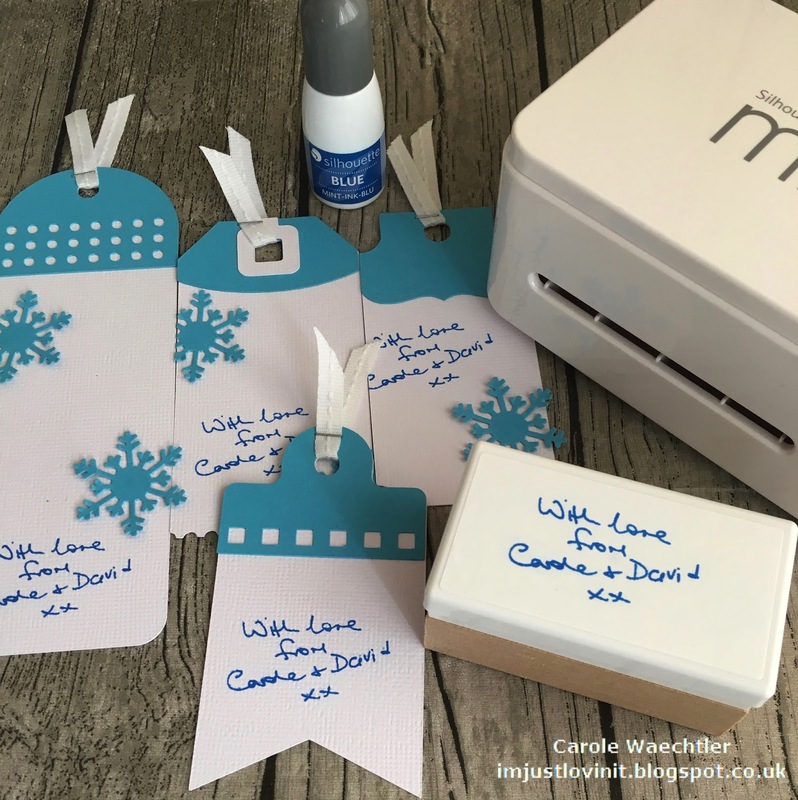 With the supplies on hand a stamp can be made very quickly, no need to order one, go and shop for one, pick up one that's not quite right...the list goes on! For me though, someone who probably has in excess of 2000 stamps in her stash, why would I need one and how much use would I get out of it? It didn't take me long to realise that this little gem of a product was probably best used for mass production of stamping projects. 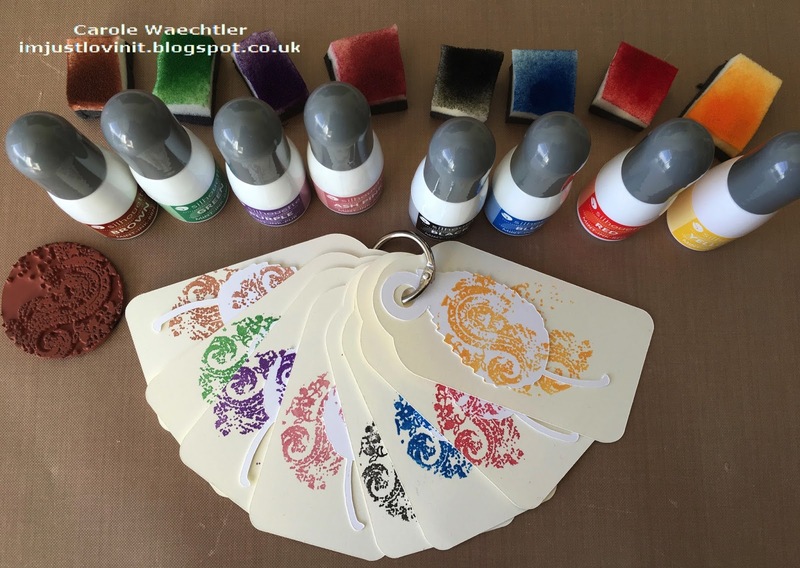 The stamps made are absolutely perfect for mass production, they really don't need re-inking very often and miss stamping with them, is far less likely than a regular stamp. I cut the tags out on my Silhouette Cameo, when I do projects like this that require stamping, I always cut out an extra bit for the stamping part, just in case I mess up! There wasn't any messing up on these. They were very easy to make and stamp. 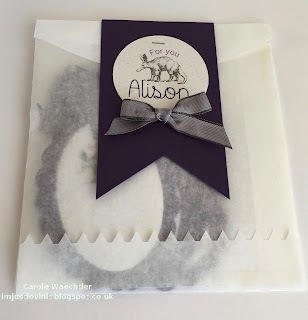 I cut the bag and tag bits out on my Silhouette Cameo too, the name "Alison" was written on the Cameo, I used a pen tool in the blade holder - simple! I think the extra tags make the gift that bit more special, made possible by quickly stamping, without re-inking that little stamp! 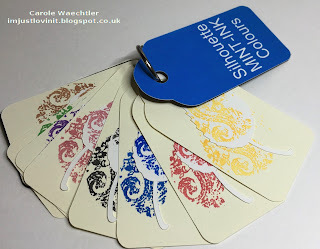 I didn't stop there, I promised Silhouette UK that I'd make them some projects for Hochanda, come back tomorrow to have a look at what I've made for them! Thanks for looking today, I hope you enjoy your Silhouette Mint, when it arrives, if it hasn't already ;)! 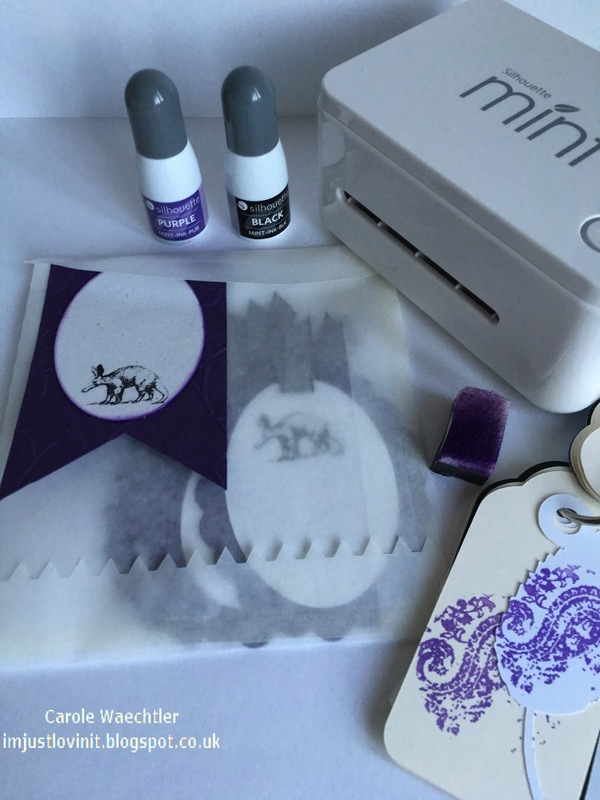 Silhouette Mint Ink - inking & stamping! I've spent another few more pleasurable hours messing about with my new Silhouette Mint. I thought I'd share some pictures and some thoughts with you about what I'm learning. 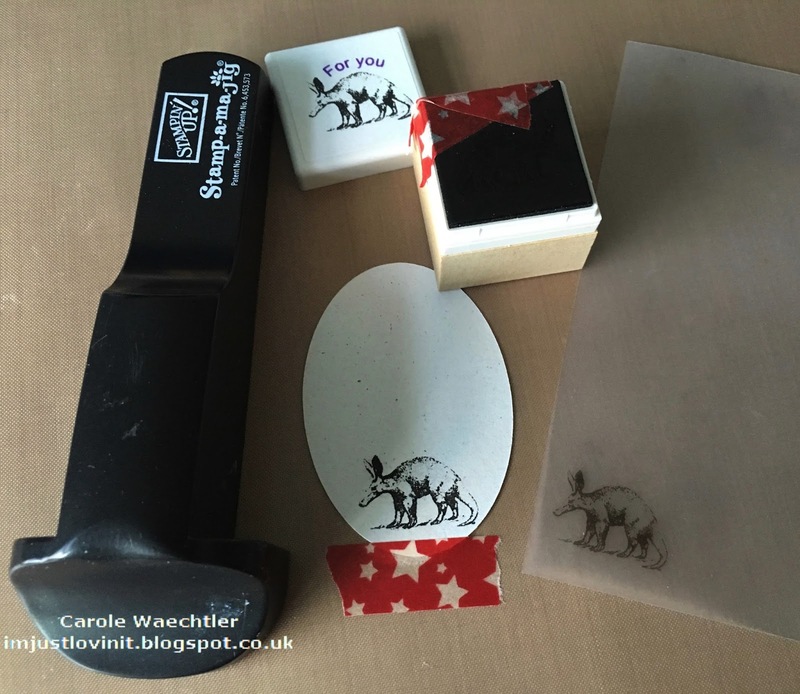 This first picture shows my Silhouette Mint in action, it is actually making a stamp of an Aardvark! 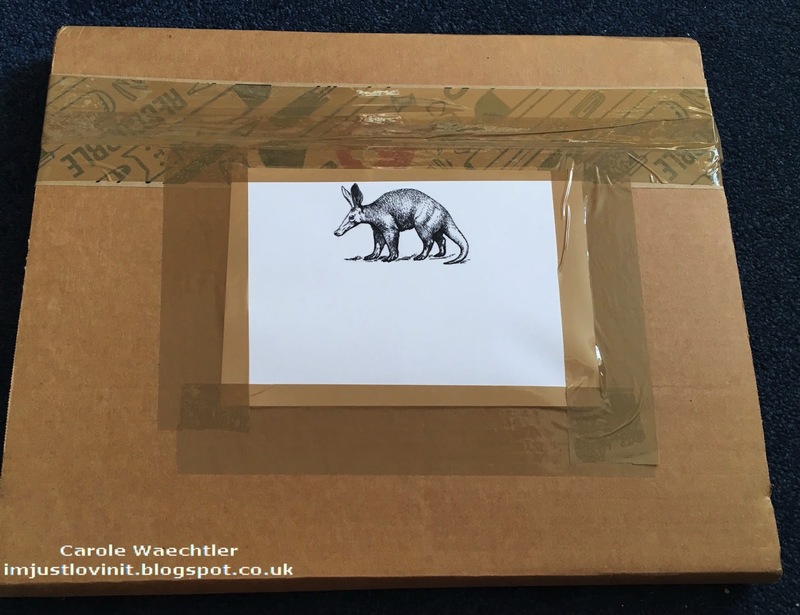 Why an Aardvark, you might ask? I guessed that if I wanted to test this little machine properly, I might as well make a stamp of something that isn't readily available. In fact there isn't even a downloadable one in the Silhouette store! 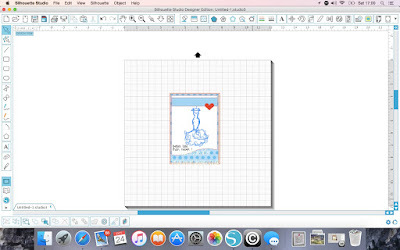 I created the stamp in the Silhouette Mint software, using a royalty free design from the internet. After making the stamp with the Aardvark on it and the worlds "for you", I started the inking process. 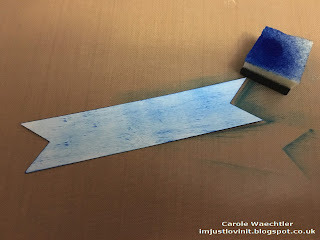 When I saw this part being shown on Hochanda, with different colours, I noticed that the colours next to each other had a tendency to bleed into one another, so I decided to ink very very carefully. I had plenty of time, unlike the demonstrators on the T.V. I chose to ink the words in purple and the Aardvark in black. I gave the inks plenty of time to soak in. Again I guessed the more time I gave them to soak into the stamp, the less likely they were to bleed into each other. 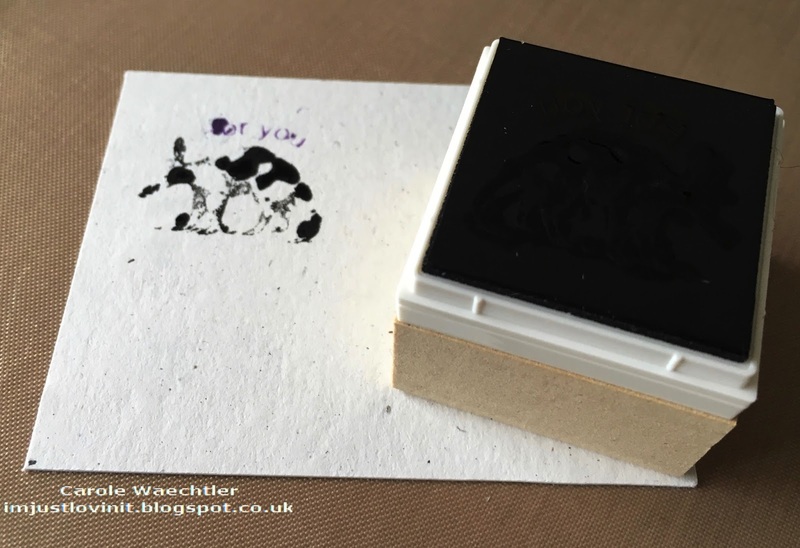 The first time I stamped (pic below), I stamped it very gently, hardly touching the card, again to try and stop the colours from wondering. This picture below shows how many times it took me to stamp the stamp before I decided the image was good enough for the stamp label and then my project. 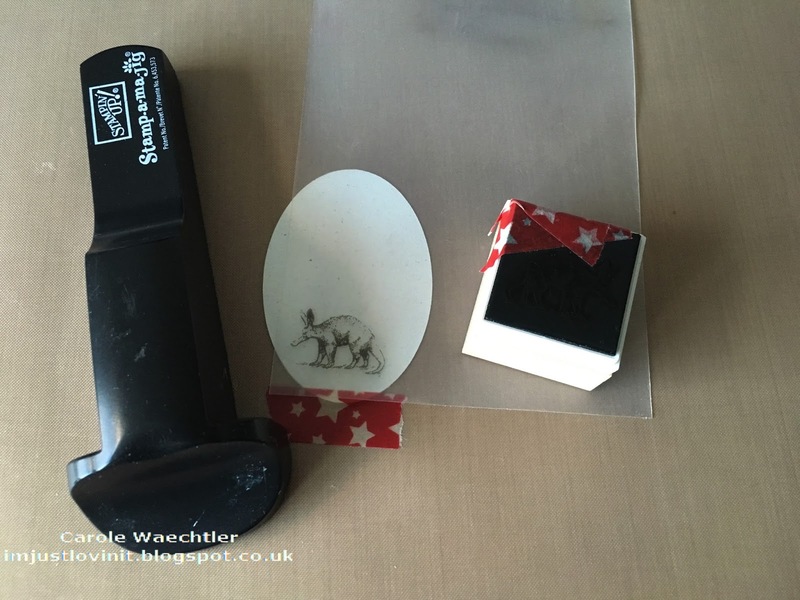 The stamp label is the image on the yellow backing sheet. It was the 10th image and it was perfect! I went on, with confidence to stamp my project.......and whoops! 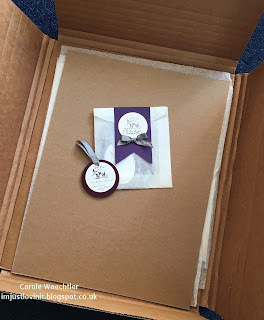 My project was the 11th time it had been stamped, but this time it was stamped onto very smooth card. If you look closely you can see the messy image! I decided a clean up was required, if I were going to want to use this stamp on smooth card. I took one of my little alcohol cleaning swabs, wrapped it around a cocktail stick and set to work. 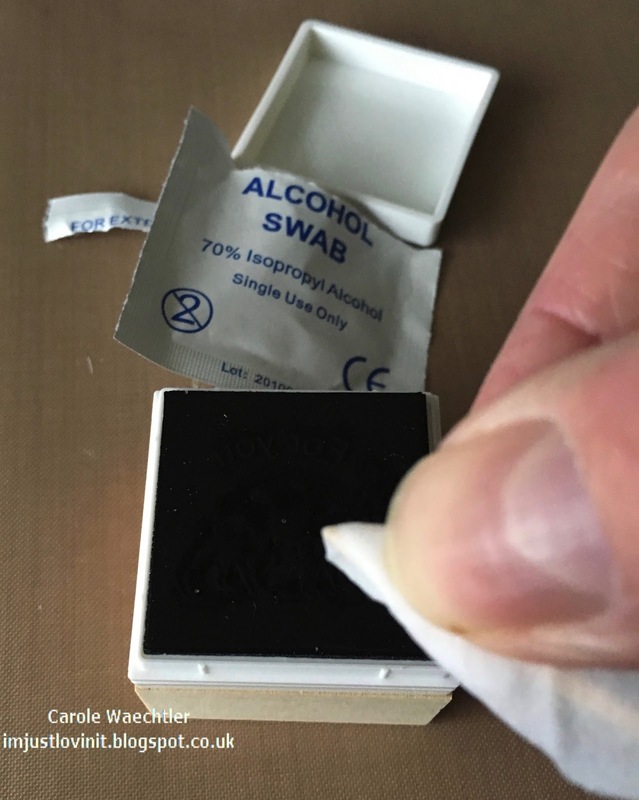 This cleaning process seemed to work really well and didn't seem to spoil or damage the stamp. You can see how well it worked in the picture below. Look closely at number 12, absolutely perfect :)! With time running out, I decided to go back to the rougher card stock, to be on the safe side, for this little tag! I hope you find my experience helpful, I'm off to see what else I can stamp an Aardvark on! 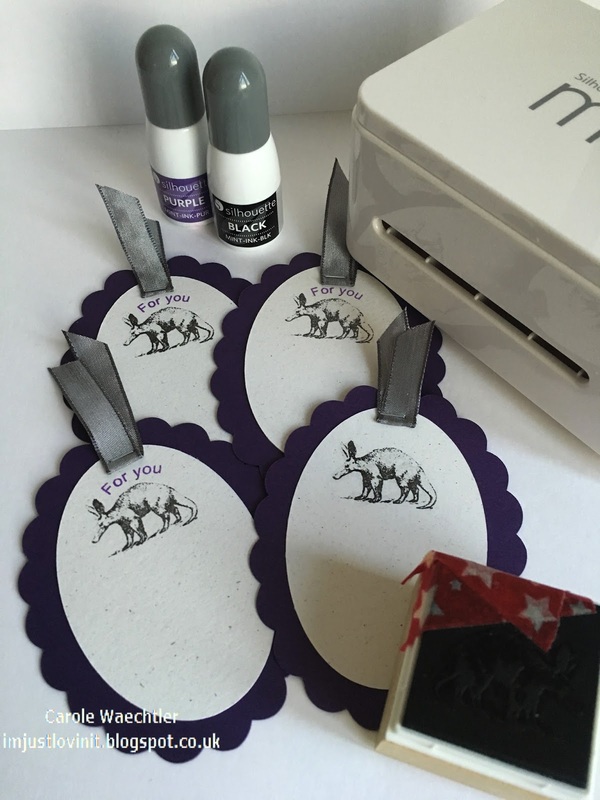 Happy crafting with your Silhouette machines and thanks for stopping by. 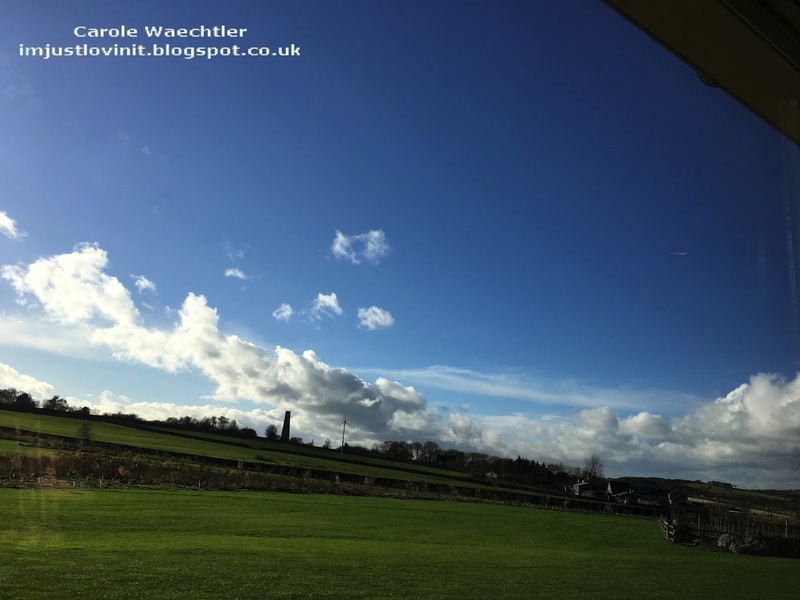 I had a few days away last week and on Friday, I spent the whole day all by myself in a very lovely hotel room, I'll share a couple of photos at the end of the post. My plan for the day, prior to going was to make some Christmas cards, but to be honest, I couldn't get my act together! I had to go with plan B, it only needed my little Mac! 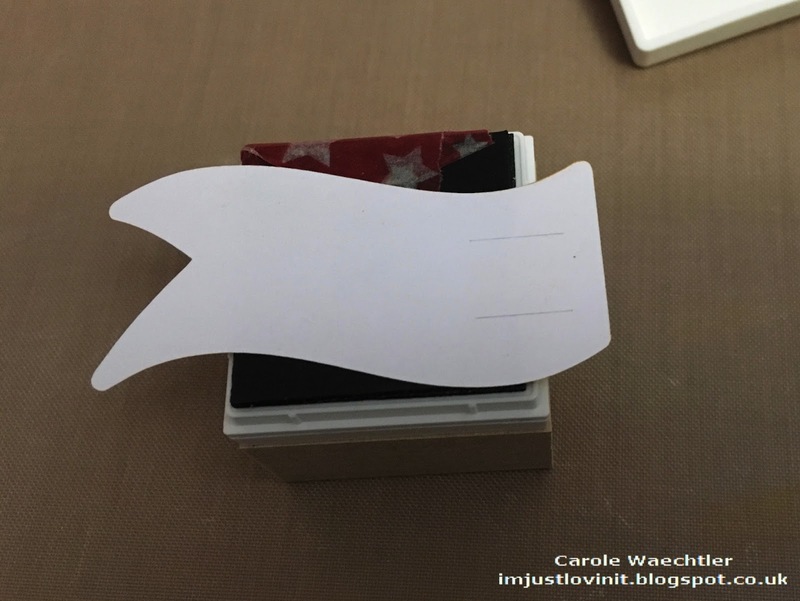 A few month ago Jules from Always with a Heart, found the envelope calculator on my blog and wrote about it on her blog, bless her. I have enjoyed looking at her blog ever since. I love the little twist that she has running all the way throughout her blog, everything she makes has a heart on it somewhere, so cute! - WOW, HOT NEWS!....I've just been on Jules's blog to get the correct links for posting this today and noticed that she's been nominated for the Britsh Craft Awards - Congratulations Jules, you deserve the recognition. I've just voted and keeping my fingers crossed for you! 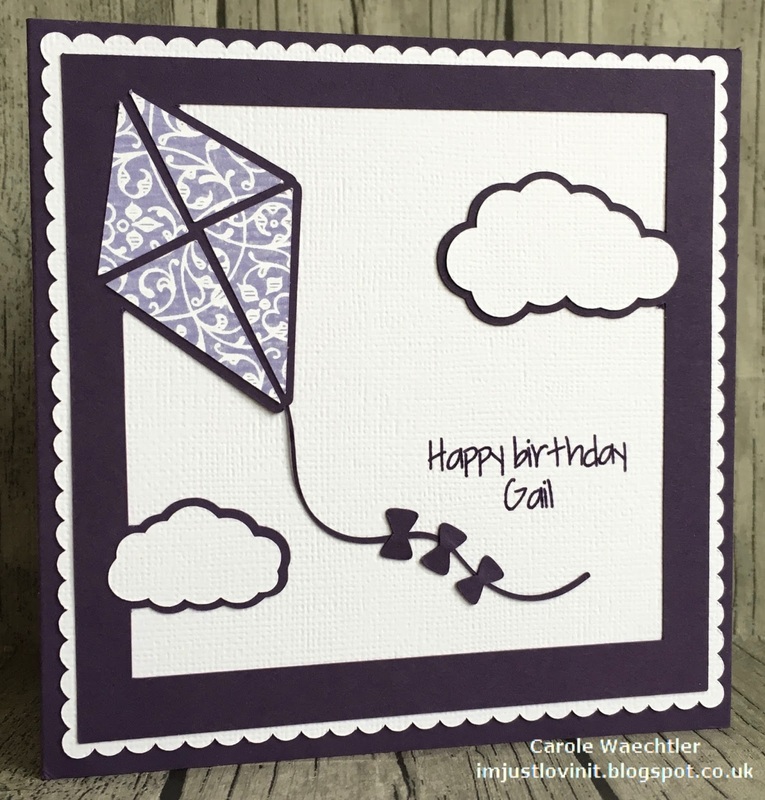 Anyway, back to the inspiration behind the card......Jules also has a great, easy to see and easy to follow Sketch Library. 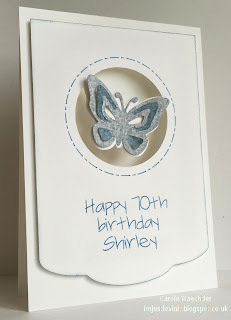 The card I made with, my new Silhouette Mint stamp, uses her sketch number 10! 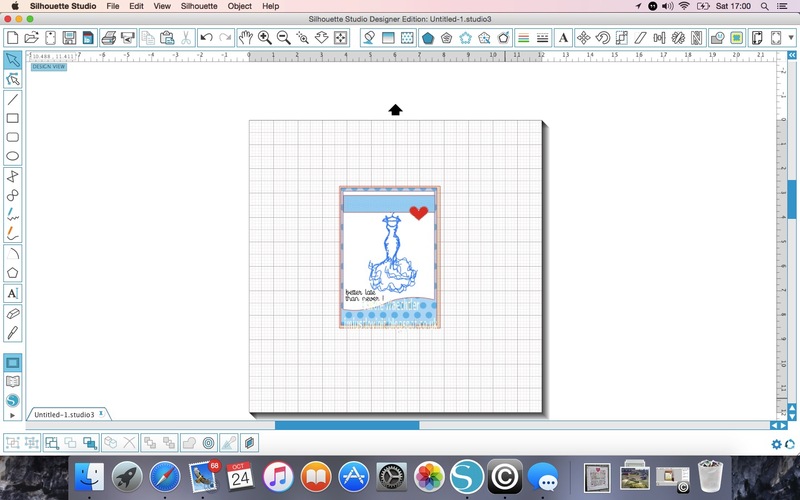 I must say, designing is so easy in the Silhouette software, I find it relaxing setting up files on my computer when I'm away from my Silhouette Cameo, it's a win win! I'm still available to teach you one-to-one....you only need to email me to book ;)! Perfect set up, I'd say....the table is always with me, it's the floor of my car boot! 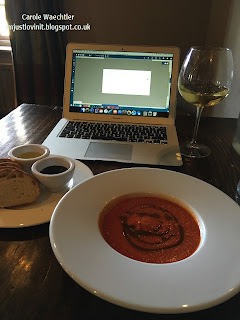 I had my little Macbook Air and Hot Panda (that's what my husband calls it!) Hochanda on the TV! 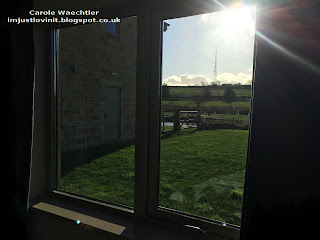 The sun was shining in on me...check out the view! It really was a room with a view! A creative girl needs lunch! 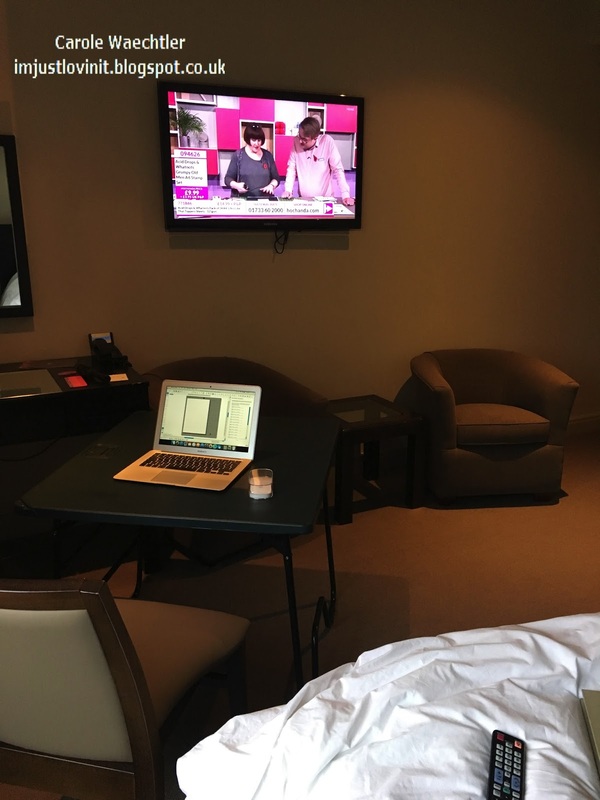 So there we go, I was feeling relaxed and enjoyed my whole day, in fact I didn't get much done, but I did prepare a whole cut Silhouette cut file, thanks to Jules! This is the last leg of my Silhouette UK Design Team, Rhinestone marathon. For this last leg, I'm sharing a Halloween Treat holder, one that I purchased from the Silhouette Design store, which I "blinged" up ;)! 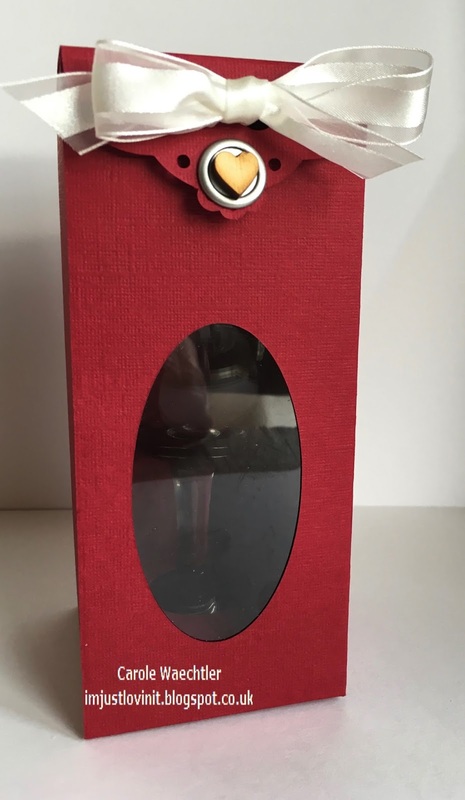 ...and this second image is a picture of the reverse side of the treat holder, the one I decided to "bling"! I hope you've all enjoyed my Silhouette Rhinestone projects. Today I start a brand new On-line Card Class, it's all about different water colour mediums.....you might want to check back to see if I can manage any of my homework! 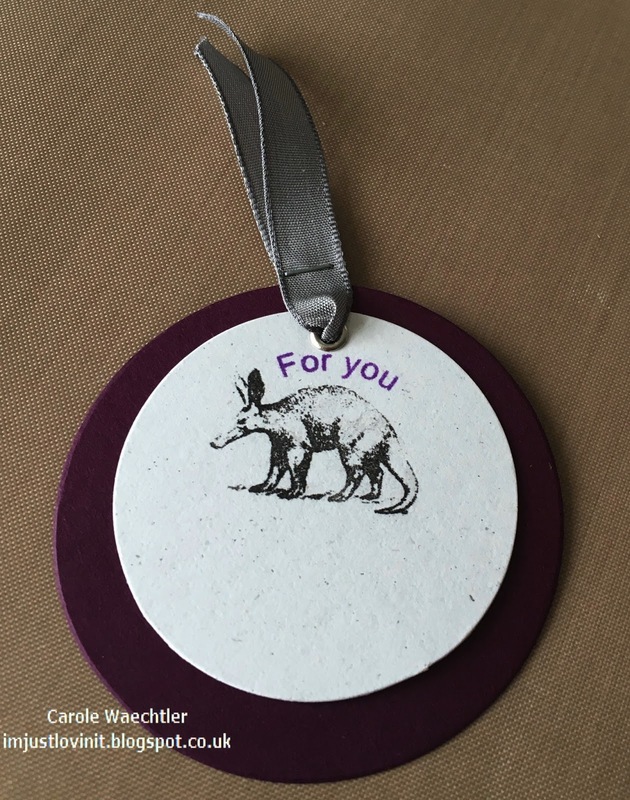 Thanks for popping by today and thanks for following along with all my DT projects, designed and made for Silhouette UK. I thought the three little Rhinestones finished off this project nicely. For the pouch, I adapted a file I had purchased from the Silhouette Design store. To give you an idea of how big this little pouch is, there are two of those chocolate mints in that little cellophane bag, you know the ones, you have to eat them after 20:00 hrs! 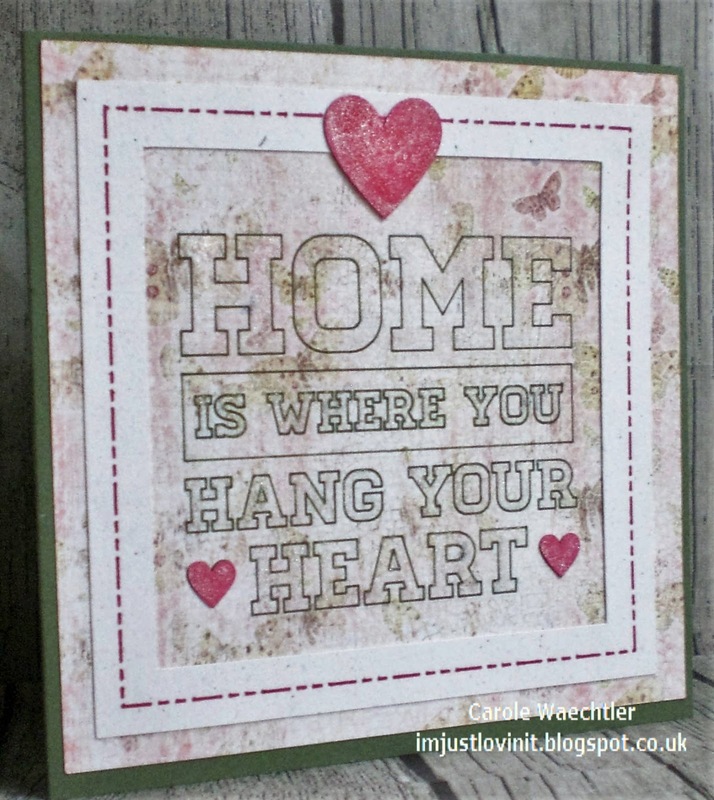 Just a quick post today, I've got so much tidying up to do! I've used Silhouette Rhinestones again ;)! Rather than fill each of the the Rhinestone holes, I made for the frame, with actual Rhinestones, I filled them with glitter! 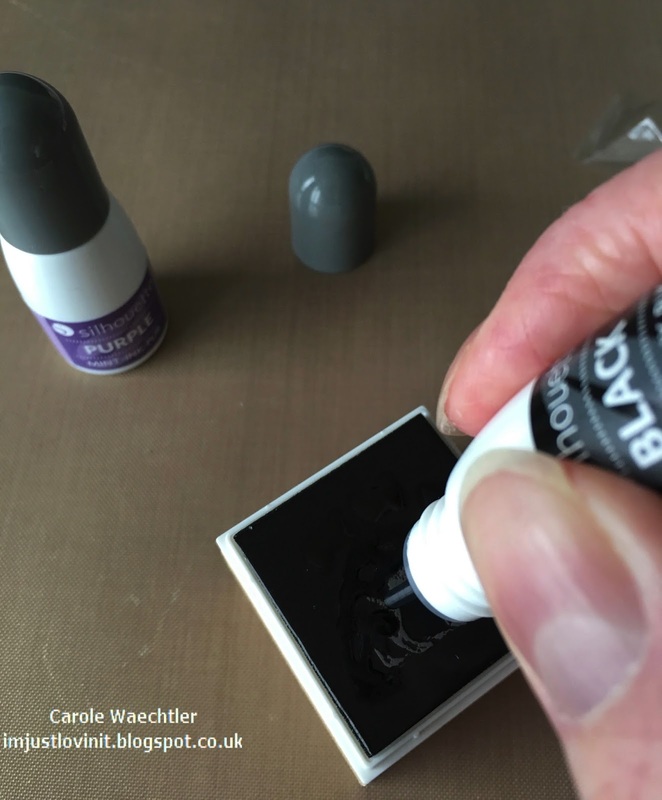 Very quick and easy, also a great idea when you are running out of your favourite colours of Rhinestones, or you are running out of time to sit and set your Rhinestones ;)! 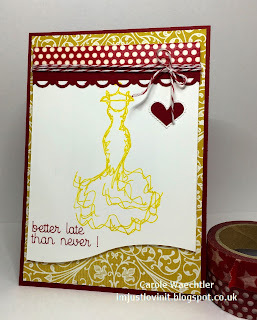 The card was quick and easy to make and even though it is a card using Silhouette Rhinestones, I'm not counting this card as part of my Rhinestone marathon! Hope you get some time to play with your Silhouette machine today. On this next leg of my Rhinestone marathon, I've used a Dragonfly image that I downloaded from the Silhouette Design store on a hessian bag. My remit from Silhouette UK was to "bling up anything"! 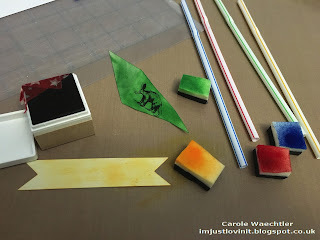 If you have been following my blog for a while, you'll probably be aware that I'm a strictly "papercrafting" type of girl, so "blinging up anything" was scary and right out of my comfort zone! You will have seen in my post from the day before yesterday, that I did manage to "bling up" a make-up bag, but I cheated (a bit), I attached the rhinestones with Multi-Matt Medium from Ranger. It was also pretty difficult and fiddly), I had to find a book (set of small books actually) to fill the bag with which did just about hold it steady and firm for me to carefully attached the bling! So with complete trepidation, knowing that I had only once chance to get this project right, I set about "blinging up" my hessian bag! I thought I'd share a couple of working photos for you to see, in this post, so to explain some of the tasks involved with Rhinestoning (don't think that's a word)! 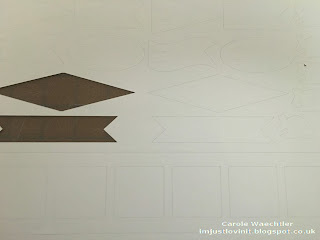 On this first picture you can see that I've selected and cut out several Rhinestone images on the Rhinestone template material. I've attached this cut out sheet onto the Rhinestone Backing Board, which makes it really stable and very easy to work with. There are a couple of sheets of each in the Rhinestone Starter kit. 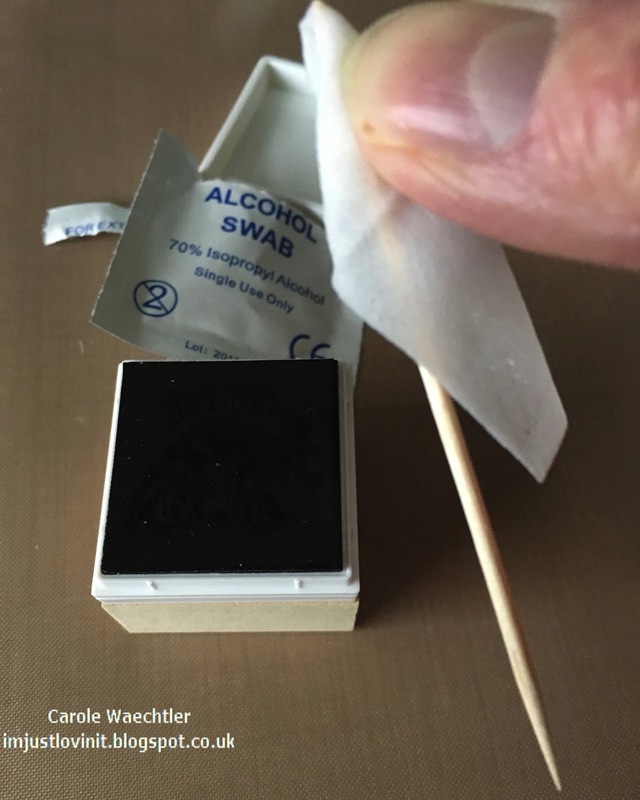 On this next picture you can see the tool that is included in the kit, which you swipe across the Rhinestone and as if by magic the Rhinestones (mostly) end up the right way round in the holes. Some of holes do get missed, so I used my Silhouette "Pickmeup" tool to pick up extra Rhinestone and place them in the missing gaps. 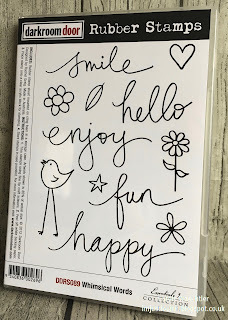 When you've filled your image with your Silhouette Rhinestones you use the special Rhinestone transfer tape (also included in the starter kit) to pick up all the Rhinestones ready to transfer them onto your project. I'm sorry I don't have a picture of that bit, I needed both hands and had to lift them gently to get them all! I laid transfer the tape onto my bag gently, covered it with one of my husbands (clean) white hankies and ironed all those little Rhinestones on! It worked like a dream, so much quicker to iron them on like that. I let the glue cool down slightly before removing the transfer tape, which came off really easily and I've saved it back onto the backing sheet, as I'm sure it will work for at least one more transfer. Doing this project has given me the confidence to "bling up" more things, I'm sure now that when I'm out and about I'll be looking for things to "bling"! For the matching tag and card, I used the same file, but this time I was able to "Scale" the size of the Rhinestone pattern down, which you can't do if you are going to use the Rhinestone image for actual "Rhinestoning"! 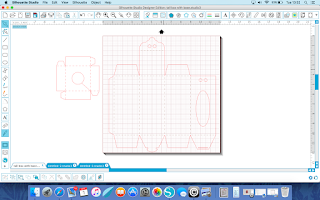 I scaled the Dragonfly down and used the "Print & Cut" feature in the Silhouette software. I filled the scaled down design with a patterned paper, printed it off onto a nice sheet of white card and then cut out the scalloped shape around it. 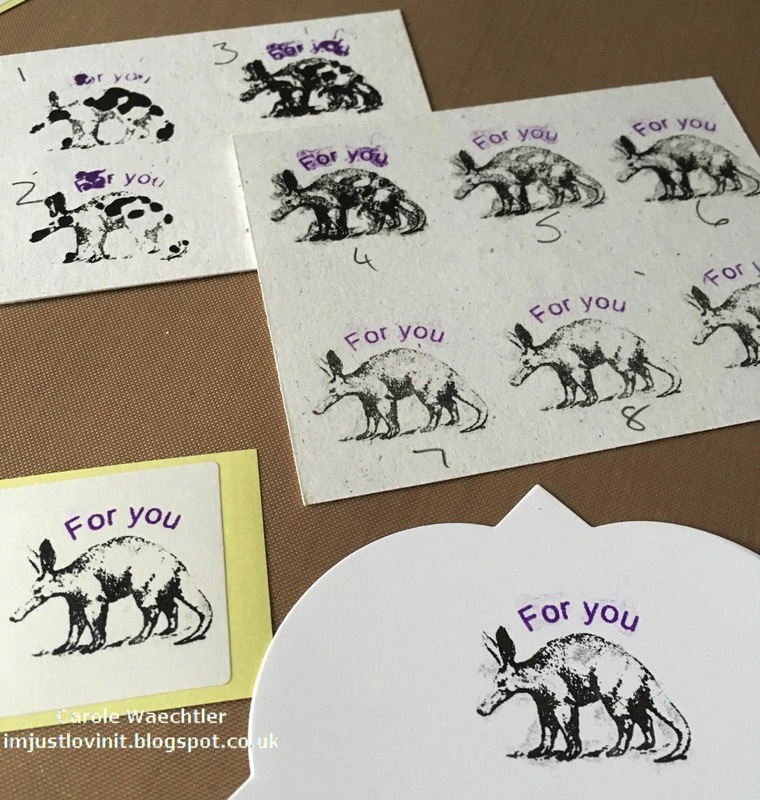 I then used my pen tool in my Silhouette Cameo for the sentiment and a couple of rubber stamps and matching ink, to make the background more interesting. Phew, that really was another "marathon", a marathon post within my marathon Rhinestone Silhouette UK event! 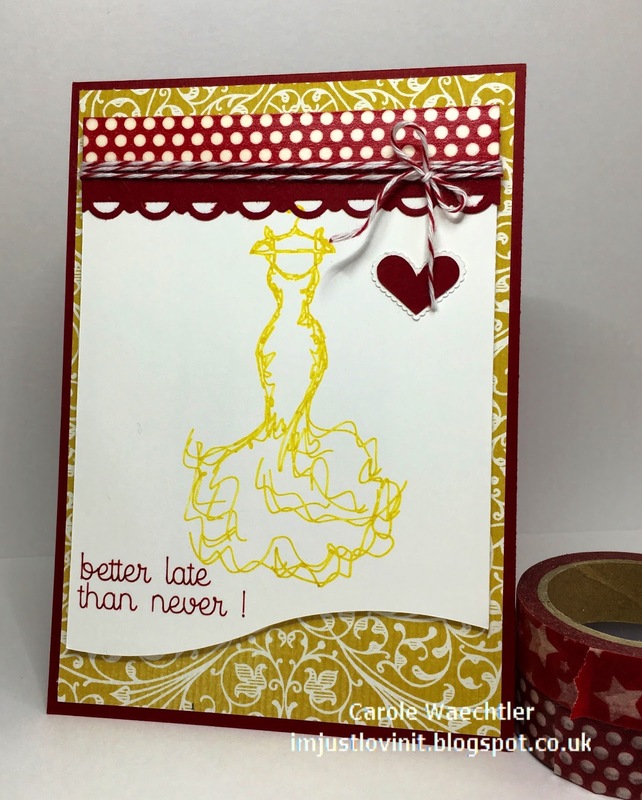 Hope you get some time to try out some new ideas using your Silhouette machine soon! Happy Silhouetting and thanks for popping by.